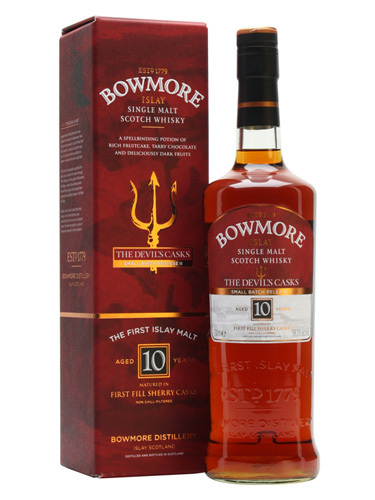 Arguably the most anticipated Scotch whisky release of 2013 was the first edition of Bowmore The Devil’s Casks. It created such a buzz that we sold our allocation in under two minutes (it would have been the fastest-selling product of the year, but for the matter of that Karuizawa…). One year on and the second batch has been released – like the first batch, it was matured for 10 years in first-fill sherry casks, bottled at high strength (56.3% abv), and once again there were only 540 bottles for the UK. Legend has it that the Devil once visited Islay. Heading straight for the capital, Bowmore, he initially wanted to hide in the town’s church. 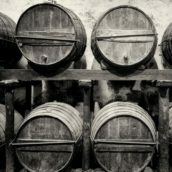 As it’s round, there were no corners for him to conceal himself, so he headed into the distillery and hid in a cask. And when the distillery released the new dark expression, the name was easy to choose. 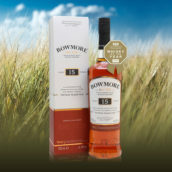 Bowmore The Devil’s Casks Batch 2, 56.3%. Nose: Rich – notes of treacle, Werther’s Originals and toffee combine with liquorice and smoke. Palate: Warming – prune, chocolate, Christmas cake, raisin, truffle oil and cinnamon are all balanced against the backdrop of peat smoke and the merest hint of lit matches. Finish: Long, with smoky raisins continuing to the very end. 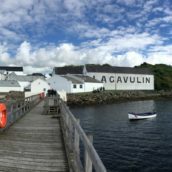 Comment: Very well-balanced – sherry-cask maturation and peated whisky can be a difficult combination to get right, but the high abv is not overpowering and the whisky is moreish – even at this strength. Nose: Weighty, heady aromas of treacle toffee, Demerara sugar, candied orange and a hint of leather. Palate: A few drops of water exorcise the whisky, releasing notes of toffee, clove, cinnamon and chilli chocolate, along with subtle peatiness. Finish: Big spices and dark chocolate linger long. Comment: Big, big flavours, but everything is in balance. A dram to take your time over. So how did the second release differ from the first? 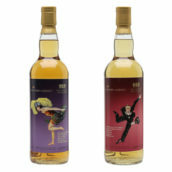 Comparing them side-by-side, the first release was slightly darker in colour and this was apparent on the palate – the new bottling was very slightly sweeter than the original, but was still full of the hallmarks of sherry-cask maturation: raisins, Christmas cake and chocolate. Hopefully this won’t sit on people’s whisky shelves gathering dust, it’s tasty and deserves to be drunk – if you get a chance to grab a dram, make sure you do.